Have them boiled or flip an omelette… now you can include eggs in your breakfast without worrying. According to a study published in the American Journal of Clinical Nutrition, researchers tracked 128 participants for over a year and concluded that consumption of eggs doesn’t affect cardiovascular health or lead to an increase in cholesterol, blood sugar or blood pressure. Indeed, the study showed that there was no significant difference between those who ate more eggs and those who ate less. 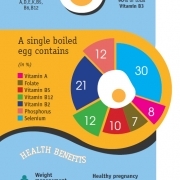 Eggs are high in dietary cholesterol but consuming them has little effect on cholesterol in the blood, say researchers. In fact, they are a rich source of protein and micronutrients that support a range of health and dietary factors including regulating the intake of fat and carbohydrates, eye and heart health, and healthy blood vessels.